2016. június elején, a 9.c osztály angol nyelvű budapesti városnézésen vett részt osztályfőnökük, Papp Ágnes tanárnő szervezésében és kíséretével, valamint Juhász Mariann tanárnővel. A csapatok angol nyelven mutatták be egymásnak a főváros pesti oldalának nevezetességeit és különböző ügyességi-tájékozottsági feladatokat oldottak meg a túra során. Itt olvashatjátok az angol nyelvű beszámolót a kirándulásról és néhány verset, melyeket a csapatok írtak. Me and my class went on a trip where we had to describe some of Budapest’s sights in presentations. For example, the Parliament of Hungary or St. Stephen Basilica, Gresham Palace and so on. 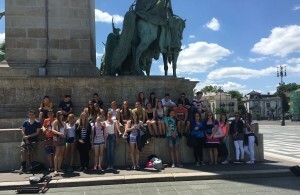 We met at Örs vezér square at about 8:00 AM, but some of our classmates were late because of the traffic, so we got on the tube at 8:30. After some travelling, we arrived at the Parliament. That was our first stop. After that we walked to the shoes on the Danube bank, which was my task to introduce. We had many exercises during the day. We had to name a poet on the Danube bank, we had to write a poem and we had to talk in English with foreign people. That was really exciting! Unfortunately, we didn’t have the chance to buy ice-cream because it was too expensive. 330 HUF and 290 HUF are just not worth it. Two of our classmates had lost their backpacks, so we had to wait for them too. One of them lost his near the Basilica and the second one lost his at Heroes’ Square. Fortunately, they both found them. The backpacks were not touched or moved, so everything was fine. Our last stop was Vajdahunyad Castle and my two best friends introduced that. Finally, we left the city centre and got on the tram. We (actually me) arrived at 14:15, when school was supposed to end! In conclusion, it was very tiring. It was hot, but sometimes it was cold. However, we had great fun together! We’re here because the weather is sunny. And don’t forget Ádám, the blue pullover boss. We left the palace and said goodbye. a girl passed them with a necklace. The weather is warm and sunny. unfortunately they don’t like the rules.